Our cone crushers are of advanced design with a small footprint and high capacity in relation to size. They have high reduction efficiency and give very good product shape. With hydraulically adjusted CSS, the option of automation, a choice of several different crushing chambers, and many other high-performance features, each model is versatile, user-friendly and highly productive. Our CS- and CH-series of cone crushers have a wide field of use as they can easily be matched to changes in production through the proper selection of crushing chamber and eccentric throw. Our cone crushers are ideal for secondary and tertiary crushing and the compact and easy-to-service design makes them a perfect choice for mobile installations. Our sophisticated HYDROCONETM technique enables you to run your crusher at maximum performance levels under changing feed conditions without overloading the crusher. 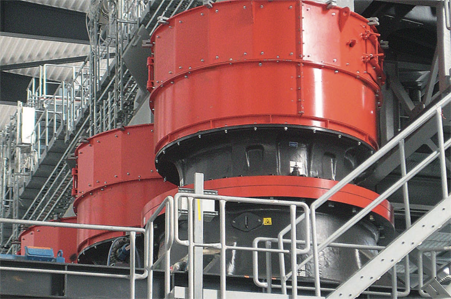 Together with our automatic control system you will have a crusher which safely maximizes operational uptime.